1922 was the first year that WOMEN could register to vote in Kosciusko county. Registration forms may not be fully filled out. Most, however give the age and birth date of the individual. 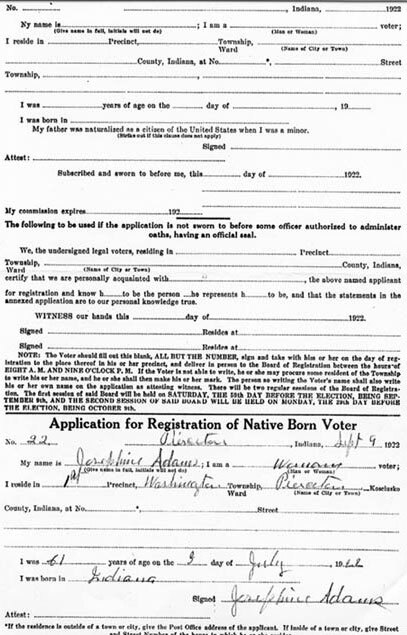 Applications for Registration of Native-Born Voters could be filed out and presented to the Board or filled out in their presence. 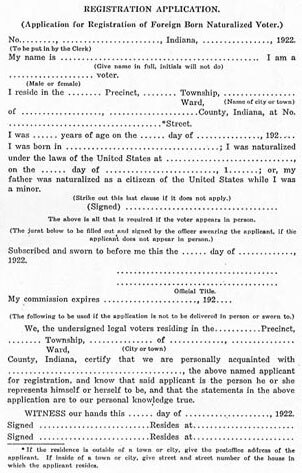 Foreign-born naturalized voters applications document the person's naturalization information. CAUTION: While this index includes 4,588 entries, the collection of registration forms is NOT complete. Some of the township envelopes of applications can not be found. Thus some townships are not completely represented (i.e. Etna Township with only 7 applications). Sue Zellers will provide copies of the registration for a nominal fee.